After reaching extinction here two centuries ago, 17 bison were brought to the Tarcu Mountains in May 2014 from various European countries in the largest reintroduction of bison ever to take place in Europe, and later in the summer another 10 will join them. The ultimate goal is to build a herd at least 500-strong living in total freedom by 2025, in an area spanning 1.4 million hectares of wild mountain and valley in the southern part of the Carpathian chain. This weekend break allows you to witness the extraordinary story! European bison in the Southern Carpathians rewilding area, May 2014. Using a completely new approach, Rewilding Europe and partner WWF-Romania initiated the reintroduction of bison to the Southern Carpathians. Other animals will be released at regular intervals at several pilot sites over a ten year period. In September 2014 the first bison will be released into the wild, and become the first to roam the 59,000-hectare Tarcu Mountains Natura 2000 Reserve since the 18th century. Once in the wild they will not be fed, so will be quickly absorbed into the region’s natural ecosystem. Also known as the wisent, the bison is a key species in the European ecosystem, playing an important role in biodiversity and the balance between forest and grassland habitats. In addition to being a flagship species for the re-establishment and subsequent protection of wilderness areas, the bison may also become an icon for regional economic development, as its presence will help to put the area on the map as one of Europe’s major wilderness areas, and a prime destination for wildlife watching. The best time to go to the bison area in the Tarcu Mountains is from mid June to late August. This is a 4 nights / 5 days trip provided by Wildlife Worldwide, UK. Fly to Timisoara via Munich. On arrival you will be met by an English-speaking guide and transferred to simple accommodation in the village of Rusca beside the Tarcu Mountains Reserve, near the mountain town of Teregova. This evening a member of WWF-Romania will talk about the scope and aims of the project. Local guesthouse – 4-nights on full board basis. 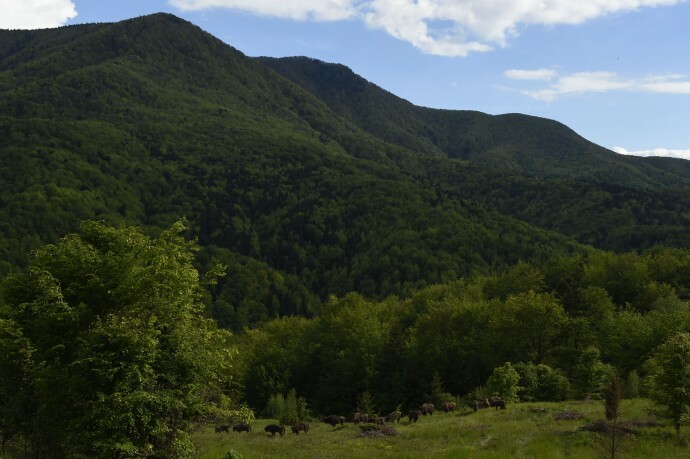 Morning walk to the bison enclosure to see the small herd of European bison that was reintroduced to the Southern Carpathians after a 200-year absence, accompanied by an expert who will explain the work of the project. After lunch, drive to the newly-built Bison Interpretation Centre to hear more about this magnificent creature, and the story of its reintroduction. Later in the afternoon return to your accommodation. Today you drive deep into the mountains to a hunters’ hide for an opportunity to watch brown bear and learn about the other inhabitants of the forest. Sadly, bear hunting is still widespread in Romania, however this initiative hopes to gradually eradicate the ancient practice by proving to hunters that bears are of greater value when alive, and by encouraging them to use their knowledge and experience to organise bear-watching activities, which will generate employment and incomes in an area where these are otherwise limited. Due to the history of hunting, however, the bear population is still extremely shy and there is no guarantee of sightings. There will be some forest walking to reach the hide. Lunch will be provided, and in the afternoon you’ll return to your accommodation. This morning you explore a nearby area of virgin forest in the valley of the Hideg River, to the east of Rusca, in the company of your guide and a local forester. In the afternoon it may be possible to arrange a visit to Domogled-Valea Cernei National Park, which lies under one hour’s drive to the south, passing through the established spa-resort of Bailĕ Herculane. This adjacent mountainous area is famed for its scenery of peaks, cirques, valleys, waterfalls, sinkholes, limestone pavements, caves and pit caves, and shelters a large variety of flora and fauna, with several rare or endemic species. 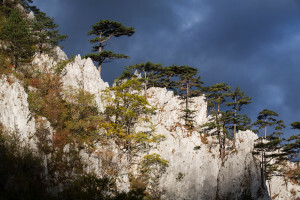 It is particularly renowned for its 1,500 species of butterfly and extremely rich flora, which includes the indigenous Banat black pine, while its rich forest birdlife includes a number of endemics. Afternoon return to your accommodation in time for dinner. After breakfast depart for the two-hour drive back to Timisoara international airport in time to catch a flight back to London via Munich.